In just over the goal line! 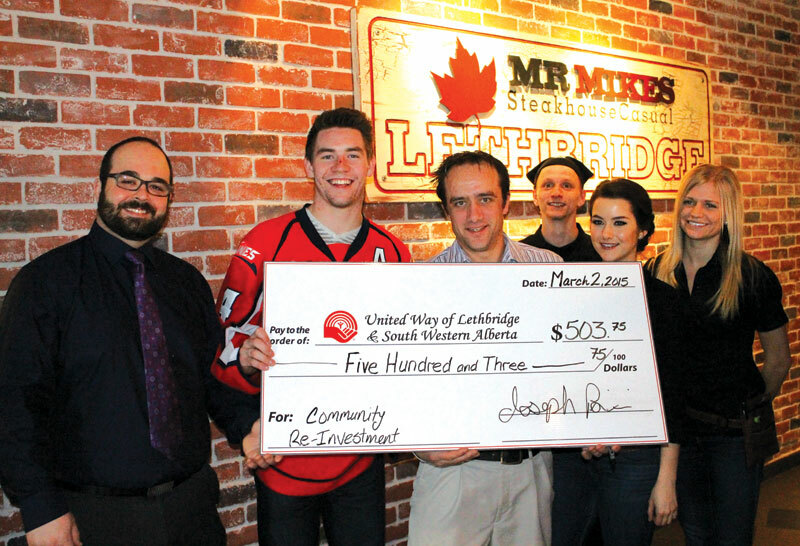 The Tip a ‘Cane event at Mr. Mike’s Steakhouse Casual on Feb. 24 raised $503.75 for the United Way of Lethbridge and South Western Alberta, just over the $500 goal. The hard work and enthusiasm of eight of the newest Hurricanes players ensured that diners had a unique and fun experience. Players included Brady Reagan, Florian Baltram, Johnny Wesley, Mike Winther, Scott Allan, Jayden Sittler, Devan Fafard and Brayden Burke who, with the help of Mr. Mike’s staff members, served food and drinks to patrons for two hours. All tips during that time period were donated to United Way. Donations to United Way’s Community Fund support more than 20 organizations in Lethbridge and South Western Alberta. For more information the organizations which received funding in 2014, please click HERE. To learn more about the Lethbridge Hurricanes and Mr. Mike's Steakhouse Casual, please visit them online.